Geographical quiz, which will allow you to quickly learn all the flags of all countries of the world! - learning mode without time pressure. Test yourself by comparing your score with the best players in Game Center. This geographical test contains the flags of Europe, the flags of Asia, the flags of America, the flags of Africa - the flags of all countries of the world. Geography is a discipline you love? Are you preparing to test your knowledge in the following topic: state flags or national flags? Or maybe you can never remember what is the flag of USA or flag of Germany? 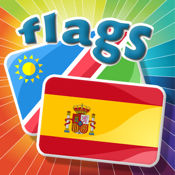 If so, this flag quiz, a kind of flags' trivia, will help you for sure!